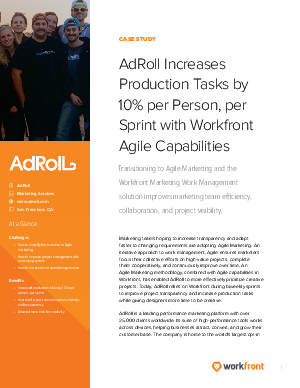 Transitioning to Agile Marketing and the Workfront Marketing Work Management solution improves the Adroll marketing team's efficiency, collaboration, and project visibility. An Agile Marketing methodology, combined with Agile capabilities in Workfront, has enabled AdRoll to more effectively prioritize creative projects. Today, AdRoll relies on Workfront during biweekly sprints to improve project transparency and increase production tasks while giving designers more time to be creative.